Murrayfield Racers are just one win away from the Stuart Robertson cup-final after a 10–3 win over Kirkcaldy Kestrels in a physical game that saw two players from each team thrown out for fighting at Murrayfield ice rink tonight. Recent Racers signing Sean Donaldson led the way with four goals in a man-of-the-match performance, and Callum Boyd, returning to the side after a two month injury lay off, grabbed a hat-trick. 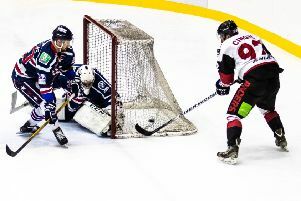 In what was Racers first ever teddy-toss night in conjunction with Edinburgh based charity Helping Hands, Kirkcaldy scored an early goal through Conor Duncan, before Martin Cingel made it rain teddies with his equaliser in the seventh minute, all before Donaldson and Boyd opened their accounts to give Racers a 3-1 first period lead. Racers dominated the middle period out-shooting Kestrels 22 to six and increased their lead to 7-2 through goals from Michael Ireland, Boyd and two from Donaldson. Graeme Allan, grabbed Kestrels’ second goal in the 35th minute. 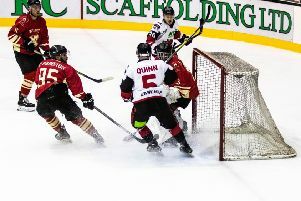 Ireland’s second and Boyd’s hat-trick goal had Racers 9-2 ahead before a flash-point with six minutes remaining saw Racers Craig Main and Stevie Clarke plus Kestrels Sean Cochrane and Ryan Todd ejected from the game for fighting. Further penalties were dished out to both sides and strewn equipment left all over the ice was recovered, halting play for over ten minutes. Donaldson grabbed his fourth goal soon after the re-start, and Liam Danskin, with Kestrels third, rounded off the scoring.